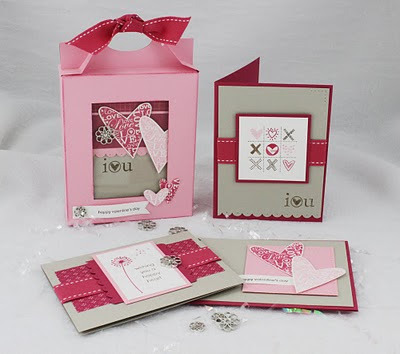 Tell someone that you love them with this Valentine’s-themed card kit. The custom designed window gable box adds a beautiful touch to this four card set. 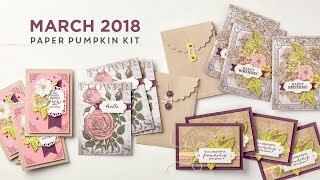 Your Class-to-go includes A Happy Heart Stamp set, 2 full size Ink pads, and 3 Stampin’ Write markers, sheets of the Cardstocks and Designer Paper, as well as the decorative accessories, and envelopes. by Friday January 18th to order your Class-to-Go. Once payment is receieved, supplies will be ordered and the Class-to-go should ship out to you on 01/25/10. The Project Guide will be emailed to you. This product is provided by and will ship directly from me. 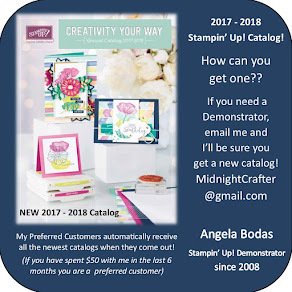 This class kit is not available for purchase to other Stampin’ Up! demonstrators. If you are a demonstrator and are interested in this class, please email me angelabodas@comcast.net for more information. Refunds will only be processed upon return of all materials, and a $20 fee for the tutorial will be withheld from the total amount.